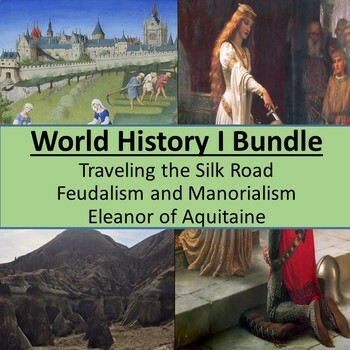 This World History I bundle contains three products; my Traveling the Silk Road Simulation, Feudalism and Manorialism Simulation, and my Eleanor of Aquitaine Biography and Resume Writing Activity. All three plans engage students in creative and immersive lessons! If you enjoyed this product you can let other teachers know by leaving a review. You'll earn TpT Credits when you do! I appreciate your help and support. The author of this work is the copyright holder and reserves all rights. This product is to be used by the original downloader only. This product nor its components may not be resold or used for commercial gain. Copying for a teacher, classroom, department, school, or school system is prohibited. Additional licenses may be purchased at a discounted price. This product may not be distributed or displayed digitally for public view. Failure to comply is a copyright infringement and a violation of the Digital Millennium Copyright Act (DMCA). Images used are in the public domain or with permission of the photographer for this product only.